I wish I could say that I have memories of the day when this picture was taken, but I do not even recall seeing it until after my father’s death in 1997 when my mother passed it on to me. It was taken on the front steps of the home I grew up in Sudbury Ontario. My parent bought it, their first and only home in 1967 and lived there untill my mother sold it a couple of years after my father died in 1999. My father would have been around 41 years of age and I have to admit I am jealous that he had less gray at that age than I did. I have few memories of my Grandfather Olivant as he was older when I was born and both he and his wife were in declining health. Grandpa made his living as a coppersmith and among my most cherished possessions are two copper pots and a copper kettle he made with his own hands (we still have many of the tools he used). I often look at them and imagine him making them from raw metal with just his hands and tools. In a very real way I feel the connection with him through his work. 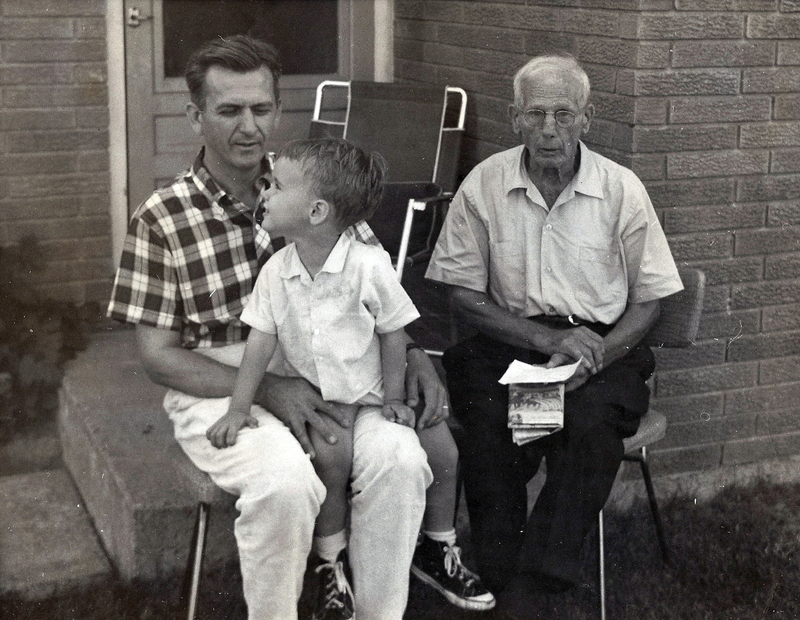 This entry was posted in 1960's, Family Portrait and tagged Gordon Olivant, Harold Olivant, Olivant, William Olivant.